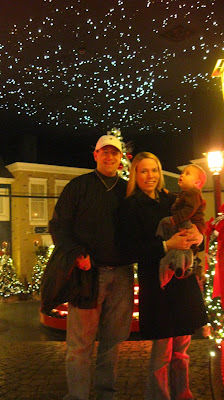 Matt and I have been talking a lot lately about the new Christmas traditions we want to start as our own with our first Christmas with a child. We have been having a blast experiencing everything like it was the first time just because of Harrison. 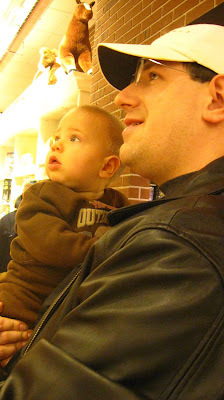 This week we took him to a nearby store that is more like a town! He was a tad overwhelmed as most of the time he spent with his eyes wide and mouth hanging open! 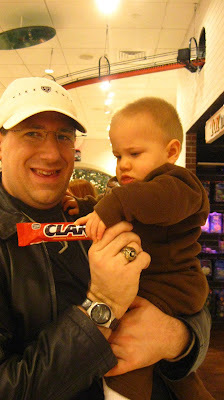 The boys did find a Clark bar to enjoy! 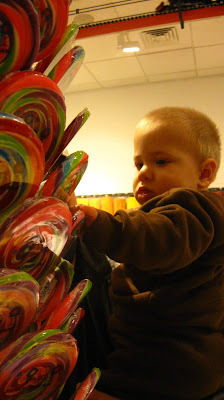 And of course Harrison found a treat he wanted...candy fascination starts young! 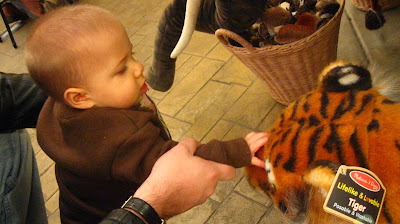 He wasn't too sure about the tiger...not sure why. Not like he was had a lot of interaction with them. 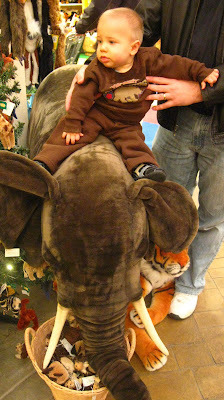 But the elephant he was taken with-he had a blast riding him! 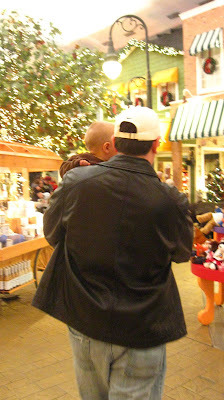 Too bad the price tag exceeded Harrison's Christmas present budget for the next 25 years! My men's favorite part in the whole shop was the train that ran along a track mounted to the ceiling. They followed it around the whole store and Harrison provided much entertainment for all around as his arms and legs flapped in anticipation as the train would approach. This was my favorite room-it had twinkling stars, a frozen pond, and it actually snowed in there! 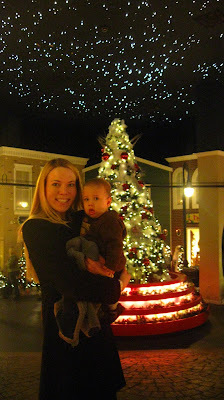 Unlike me, Harrison was very wary of the star room-maybe a bit overstimulating for a nine month old? But all in all we had a blast. We continued on a Christmas tradition Matt and I have had for a few years. We bought a new Christmas candle. This time we picked it out as a family. We can't wait to continue establishing our traditions with our children!